A prototype , by definition, can be very different from the product that will then be sold on the market. One of the examples could be the first prototype of the first Apple iPhone . It is a model that highlights the great work done by the Cupertino company to carry it out. What you see in the images that The Verge has gathered is an EVT (acronym for Engineering Validation Test) of an iPhone in 2007 . The first smartphone made by the company and one of the most iconic objects in the technology sector. As you can see, this prototype is less compact than the smartphone was. To simplify debugging and run the various tests it was therefore necessary to use different components (at least in part) from those that will actually be integrated. Apple iPhone , for EVT , therefore had a generously sized motherboard, connectors, slots and ports that can also be found on a computer . In this case it is also possible to see the screen positioned in a corner so as to provide useful information while the access is via a button positioned on another corner. According to reports, some iPhones given to the engineers, however, did not even have the integrated screen and had to be connected to external screens. 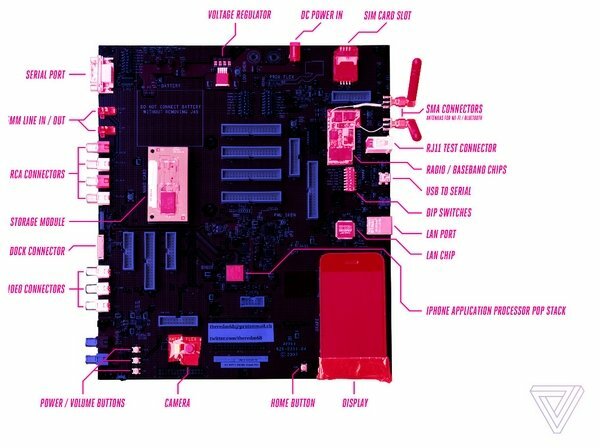 Some details have been disclosed, such as the red coloring of the motherboard indicating that this was a prototype and not a final version. The serial connector was used to test the iPod accessories and there is a RJ45 and an RJ11 port (the latter was used to test voice calls with a classic telephone handset). In this Apple iPhone prototype there are also two miniUSB ports that were used to connect to the modem and the processor. There is no shortage of connectors to monitor voltages and various integrated signals. On one side you can also see the presence of two antennas for Wi-Fi and Bluetooth and obviously could not miss the slot for the SIM. Finally we can also see the Samsung branded memory (K4X1G153PC) under which there is an 620 MHz ARM processor (ARM1176JZF). The operating system is saved on a 4GB Samsung NAND card (K9HBG08U1M) showing once again how the collaboration between Samsung and Apple started a long time ago.